Bluesound upgrade brings MQA support for its multi-room system | What Hi-Fi? Bluesound is the first multi-room music system to feature the Meridian developed MQA audio format. We first heard about this back in January at CES 2016, but now the Canadian hi-fi company has confirmed that from today, 1st June, all Bluesound players will have support for the MQA format. What is MQA? It stands for Master Quality Authenticated, an end-to-end technology that delivers "master quality audio in a file that's small enough to stream or download". MQA claims that you won't hear the sonic compromises that come with compressed MP3 files, making it close to the music that was recorded in the studio. 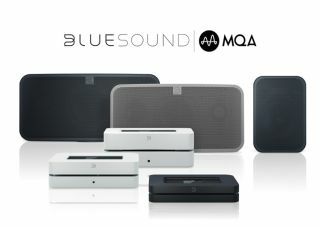 This partnership makes Bluesound the first company to offer MQA playback through a wireless multi-room system, with a free version 2.2 update of its BluOS firmware available now. The firmware upgrade also includes CALM radio integration with commercial-free access to 160 radio stations. Bluesound says it is working with MQA to integrate BluOS v2.2 operability into products from its sister company NAD. In the BluOS app, the indicator glows green or blue to show when the Bluesound player is decoding and playing an MQA stream or file.